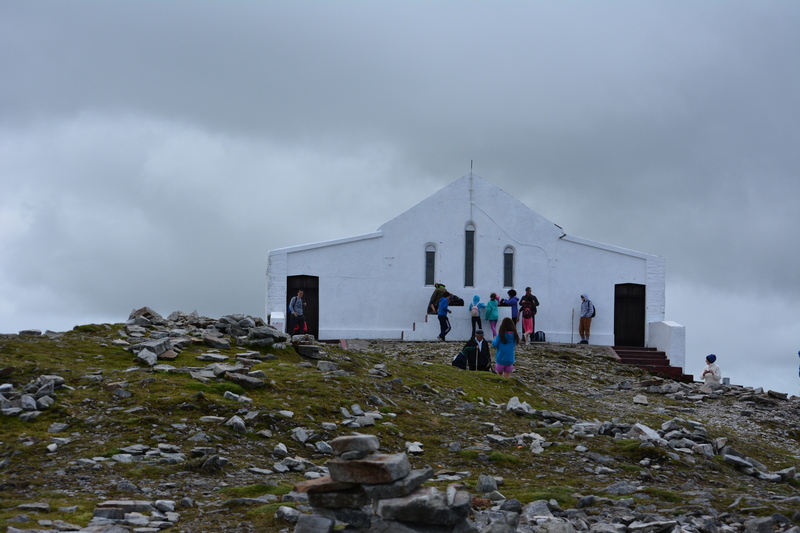 Climbing the Reek – Ireland’s Holy Mountain – proper title Croagh Patrick- with family and friends began for me four year ago – about 5,000 years after the first pilgrim made the ascent but then i’ve always been a slow starter. We do it because a family member expressed the desire and this resonated with several of us for whom making a pilgrimage while satisfying another’s wish seemed like a good investment of time and energy. Many good things in life get done, or at least attempted, for such reasons. 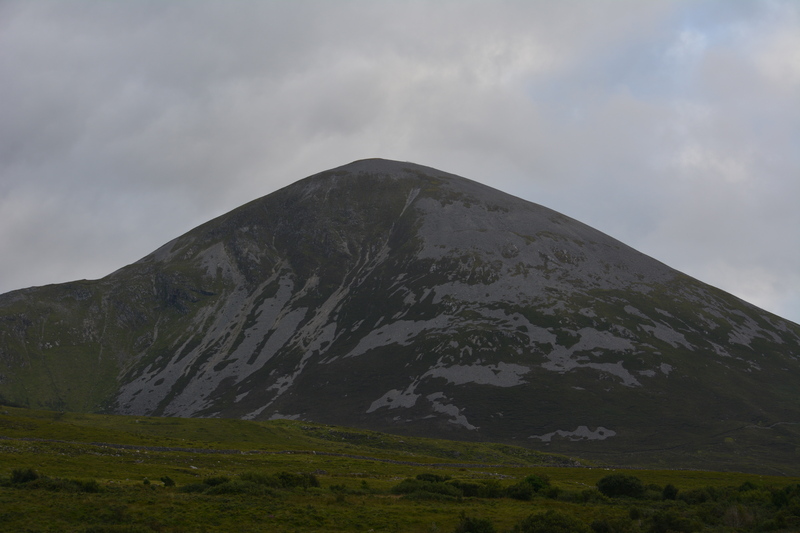 Croagh Patrick rises, with its head usually in the clouds, to about 762 metres above sea level, far from the highest mountain on the planet; not even the highest mountain in Ireland. Its middling height, which would be approved of by The Buddha, is, of course one of the reasons it is such an important pilgrimage location; too high and many people would not be able to climb it, too low and the challenge would not suffice to constitute an ‘effort’. Pilgrims, all around the world, are aware that the good things in life, like spiritual development, must be earned with effort and dedication. Pilgrims have climbed The Reek since about 3,000 BC in, as far as we know, an unbroken line of pilgrimages stretching past the origins of Christianity and far into our Stone Age origins. It is certainly humbling when you climb those slopes and think upon the number of pilgrims who have preceded you. 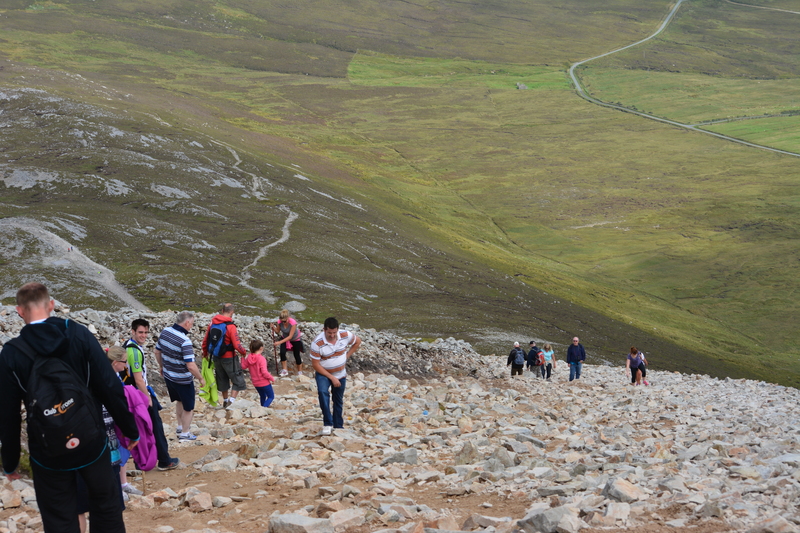 Some 30,000 pilgrims climb the mountain on Reek Sunday, the last Sunday in July and the traditional day for this pilgrimage. 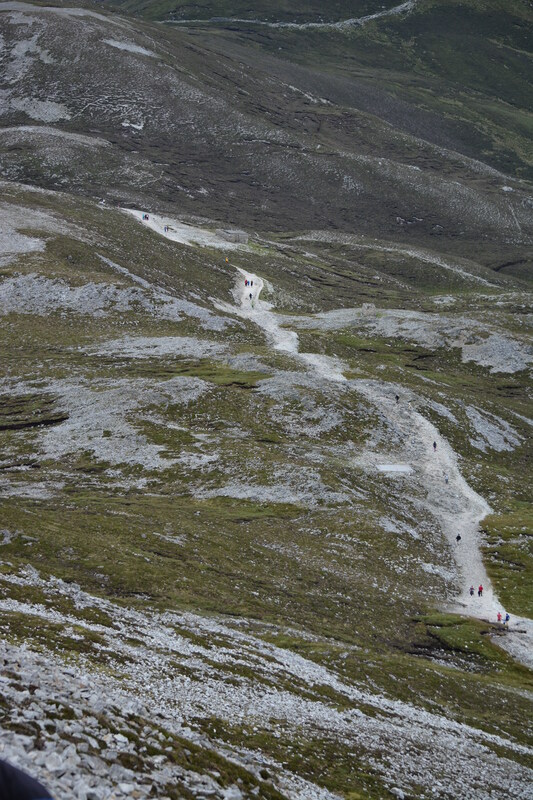 About 100,000 climb it each year, not all pilgrims of course but all in search of something. 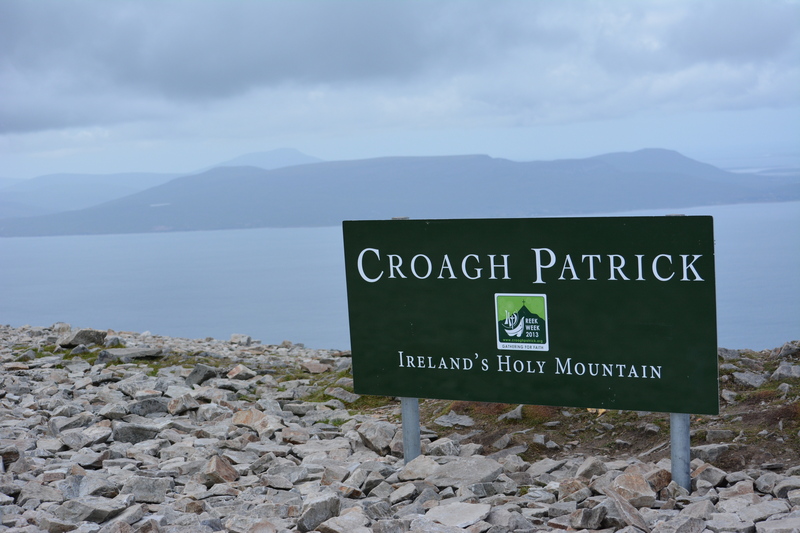 Saint Patrick is believed to have spent forty days and forty nights on the mountain summit doing penance in about 441 AD. These days, the climb up and down, taking an average of four hours, is considered penance enough. 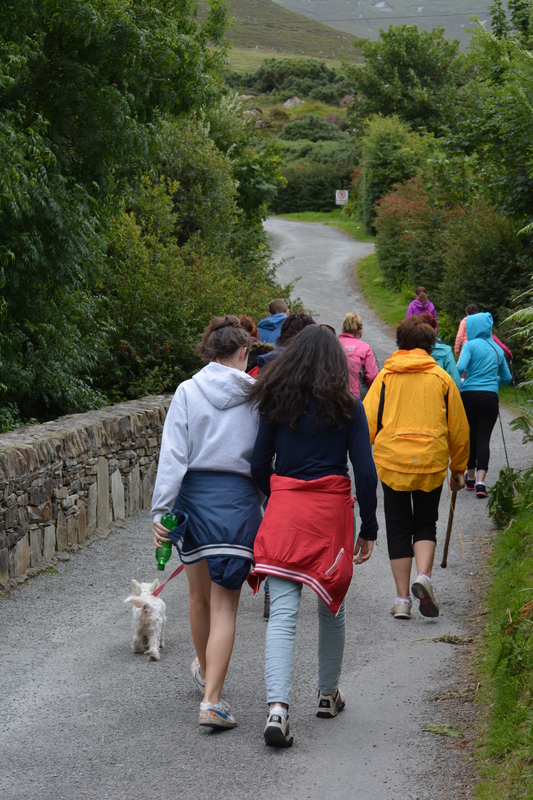 Each year, our small band of pilgrims changes slightly in composition as some people are unable to make it due to work commitments or due to illness or injury. But, each year, our band also welcomes new members as others enthusiastically join us. One of the great pleasures for me is when young people from the next generations elect to challenge themselves and join us for the climb to the summit. 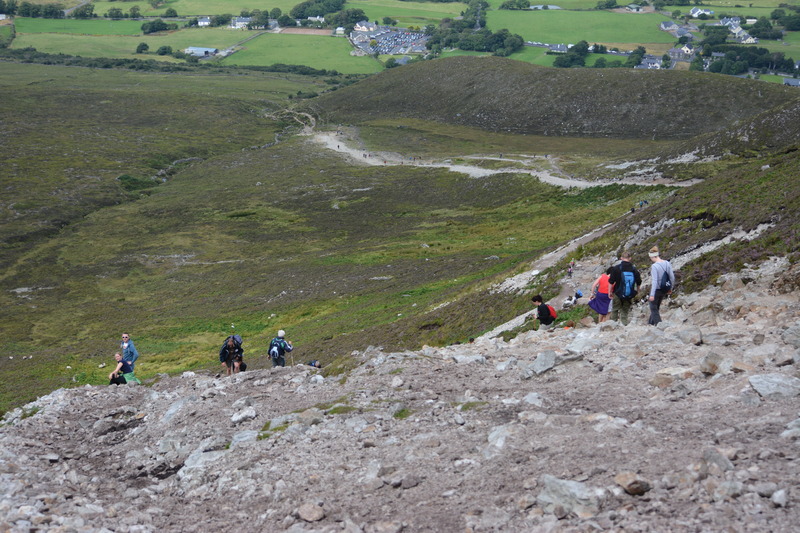 They say that the mind gives up a thousand times before the body is truly exhausted and the pilgrimage up Croagh Patrick offers opportunities for at least nine hundred and ninety nine mental capitulations. The pilgrimage starts almost at sea level and the climb rapidly becomes steeper, barely giving the body time to adjust. Before you know it, your leg muscles are protesting at the strain, your heart is beating loudly and your lungs are protesting as they seek to provide sufficient oxygen to those grumbling muscles. And still the climb gets steeper and the protests of your body increase in sympathy with the gradient. This is the time to think of all those whom you love and care about, for whom you may be dedicating your pilgrimage, who are suffering in one way or another and who amongst us is not counted in such a congregation – our humanity a guarantee of suffering. Each year we climb we seem to have more people to pray for – an unhappy function of our passing years – unchangeable, inevitable; the only constant in a changing world. It is also time to look back, to admire the spectacular scenery below us as the mountains in the distance frame Clew Bay and the islands are scattered across its sparkling waters. 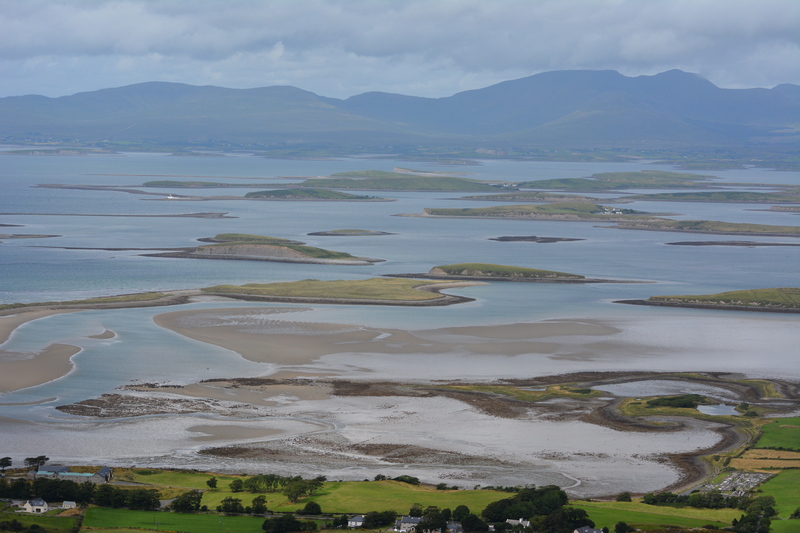 They say that Clew Bay holds three hundred and sixty five islands, one for each day of the year. Time to push on again for those of us who aspire to reach the summit. Finally we reach the Shoulder, the top of that cruel gradient. Now we face a gentle, relatively flat walk for a few hundred metres. This is the time to feel joy and give thanks. There are few who make the climb who do not relish this section of the mountain. 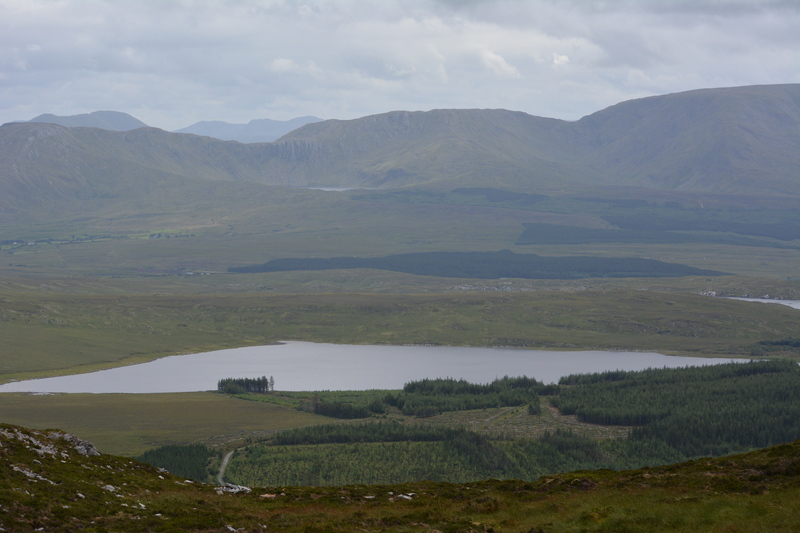 You can see the bogs and lakes and mountains on the other side of Croagh Patrick – stretching out in front of you and diminishing the distance you have covered so that again you become aware of your own insignificance. So feel the joy, revel in the physical pleasure of walking on flat terrain, give thanks for the continued functioning of your body, appreciate the margins of your life-span and influence and the comparative infinity of the mountain. Quickly, too quickly, we reach the final ascent, over a kilometre of loose rocks and stones scattered over a seemingly vertical slope; the mind objects, the body protests but everybody is encouraging each other on. Shortly, though, the rhythm of the climb takes over, the mind quietens, the protestations of the body sink into the background, the physical pain provides a backdrop but peace overcomes you. You know now that you are going to make it to the summit and that this is the final push. This is the time to get in touch with your unity; your unity with nature and what lies beyond it – the universal force – the ‘is’ – the Brahman. Your life-force, your soul, your Atman, is one with the universal force – Atman is Brahman, oneness. You look around and see your fellow pilgrims, those you know personally and those you don’t and you recognize the oneness of all of you – the connection between you that goes beyond sharing a climb to the summit of a holy mountain. You put your hand out to those who need it, as others do to you and in this spirit of peace you finally reach the summit. Now is the time for celebration, for showing the joy of the achievement, for photographs and laughter, for some silent prayers. “Yes, we made it”. 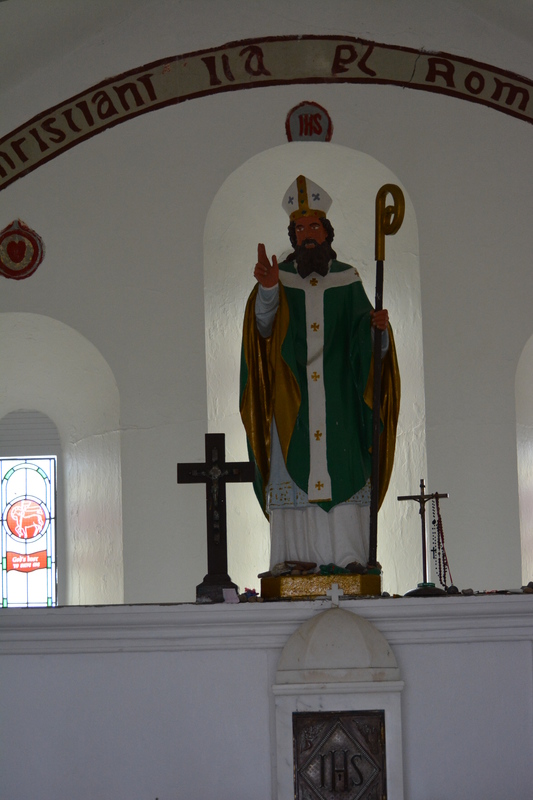 Time to refuel, to think some more on those who are not with us, about those people in our hearts and minds, think of St Patrick and all the generations of pilgrims and prepare yourself for the descent, for the return to everyday life. The last couple of years i have suffered greatly from sore knees when climbing – especially when going back down. If a pilgrimage is supposed to involve serious pain then i was a serious pilgrim. This year was different though – a knowledgeable and kind physio, an appropriate and healing set of exercises, the wisdom and determination to stick with those exercises, meant that my knees were, almost, pain free. In celebration of this astonishing improvement in my well-being i decided to run down the mountain. Total concentration, picking out the spot to place my foot, and then the next place, second by second. Selecting a path amongst the loose stones and rocks, gently going with the inevitable slips and slides so that they became a harmonious part of my journey down instead of a dangerous interruption – too much pleasure almost for a pilgrimage – and yet feeling the connection with the mountain, feeling that we were at one, moving together. I was not running down the mountain, i was running with the mountain, in harmony, its joy mirrored mine and it eased my path and steadied my path. An old lady, watching me, remarked, “You are very sure footed”. “Only practicing”, i responded, meaning that i wasn’t doing it on my own, meaning that when you are practicing you always have help. And then i was at the base, less than forty minutes after leaving the summit. This time i had not returned, i had moved on.